With the ever-rising cost of energy bills, we are all looking for ways to cut down and save energy. The water heater, and more specifically the hot water tank, are areas of the home often overlooked in favor of considerations like roof insulation and draft control. In theory, once water is heated up, any unused water sitting in the tank for an extended period of time should stay at a constant temperature level and no heat should escape. Unfortunately, due to the laws of thermodynamics and the fact that domestic tanks are only partially insulated, you may be surprised to hear that water heaters do have a tendency to gradually dissipate heat over time. This is called standy-by heat loss. The problem is particularly acute if your heating system is set to continuously provide hot water. The loss of heat translates back into energy costs as more power is required to reheat the water. In an effort to curb this, the system springs repeatedly into life to reheat the water. In essence, energy is being wasted and not used to its full capacity. There is a direct correlation between the heat lost and the size of your energy bill. Another issue that heightens the problem is if your tank is located in a garage for example where the ambient temperature is naturally lower. Understandably, the effects are at their most pronounced during the winter months. A way around this issue is to invest in a water heater blanket, otherwise called an insulation blanket. The idea is to make your heating system more energy efficient by wrapping the tank so heat doesn’t escape, or at least at a less alarming rate. This saves you money in the long run and allows you to do your part to lessen the strain on the planet’s limited natural resources, notably natural gas. In this guide, we try to understand the benefits of having a water heater blanket and offer a number of options that we feel meet our stringent quality standards. We aim to pick out the blankets that reap the most in terms of savings. We of course take the price of each model into account as well and we have chosen products to suit all budgets. Blankets have many benefits that make them an easy and cost-effective energy saving solution. Below we have listed them to highlight just how worthwhile installing a water heater blanket really is. The main factor preventing many homeowners from improving the energy efficiency of their home is cost. People are understandably concerned that the cost of installing for example a solar panel outweighs the financial benefits. This is not the case with a water heater blanket. They are modestly priced products that recoup their investment cost very quickly within a few months, particularly if the water tank covered is old. The main benefit of fitting your water heater with a blanket is that is ensures hot water stays hot for longer, limiting the capacity of the tank to bleed heat. This means that less hot water is wasted when it is not being used throughout the day and night. This results in less power used to heat the same amount of water. This will reduce your monthly gas bill and contributes towards limiting your own personal use of depleting gas resources. Even modern water heaters that have thick insulation benefit, though these are less significant than with older ones. Nevertheless, the low cost makes getting a blanket somewhat of a no-brainer. Even a small benefit yields saved dollars in the long run. Because the water is kept hot, you will have constant access to hot water. The temperature will also be consistent so you won’t have to wait around for it to heat up. A blanket is, therefore, much more convenient for daily household activities that require hot water. Equally, more hot water will be available at crucial times, such as in the morning and evening, for showers, dishwashing and the like. It may even help ward off bickering between family members whom in the past may have complained that all the hot water had been used up before they had a chance to shower. A water heater blanket is installed with minimal fuss. Manufacturers generally sell blankets in kits with all the required tools to complete the job. In addition, instructions are usually clear and concise given the importance of installing a blanket correctly. Simply switch off your water heater for safety and clean the surface of any dust. Take the measurements of your heater and cut the blanket to the required size. Cover the heater with the blanket and cut out gaps for the burner and other important parts as highlighted in our caution section below. Attach the blanket permanently to the tank with the provided tape and you are done. It really is that simple. In most cases you won’t even need a certified plumber if you have some basic DIY experience, saving you even more money. Unlike more complex energy saving solutions, the water heater blanket is incredibly easy to maintain, or we should say requires next to no maintenance. Simply regularly ensure it isn’t ripped or frayed, and replace if it is. Otherwise, simply leave it to do its job. With a blanket equipped, a water heater works less to create the same amount of hot water. Overtime this equates to less strain on the burner and piping. In the long-term your system lasts longer than if it didn’t have a blanket, warding off the high cost of replacing the whole unit for even more savings. The market for water heater blankets is loosely dominated by these key features. These can be used to determine the efficiency of a particular model and should allow you to make an informed choice that suits your personal needs. One of the most differentiating features of water heater blankets is their thermal resistance, measure by their R-value. This industry standard classification system determines the insulating properties of a given product. In other words, it measures the ability of a material or assembled commodity to resist the natural flow of heat away from a heat source. A larger R-value provides greater insulating properties and vice versa with lower ratings offering less insulation. The R-value is dictated by the quality and type of materials used as well as their width and denseness. Common materials are vinyl, aluminum, foil and fiberglass. These are favoured for their heat trapping properties. You may also want to opt for materials that are resistant to various hazards such as fire, humidity and rot. This feature is self-explanatory. Different models are suited to certain heater sizes. Sizes are measured in gallons and relate to the capacity of the tank on the water heater. Buy according to the specifications of your own heater. Blankets are commonly designed to be cut down to size so don’t worry about buying one that may be slightly larger than your tank. It is always best to go too big and trim down than find a model is too small for your heater. If a water heater blanket isn’t installed incorrectly, there is a high risk of it being a fire hazard. Always leave specific parts and portions of the water heater uncovered to avoid such issues. Regardless of the type of tank you have, always avoid the control thermostat, the overflow tube, drain or escape valve, and pressure release devices. This is notably more important for gas water heaters and we advise always leaving the top of the tank clear so you don’t disrupt crucial ventilation features. Nor the bottom of the tank due to the need for air to reach the gas burner. Without air, the burner cannot combust and ignite a flame. We recommend that you conduct proper research as to the correct way to install a blanket, follow manufacturer guidelines, and if in doubt use the service of a qualified plumber. A further safety recommendation is to always check that the manufacturer of your water heater rates the use of extra insulating layers as advisable. This relates generally to ensuring the system can operate safety. Some very recent models also already carry a high R-value and adding a blanket is, therefore, not recommended due to the limited benefits it may add. A quick phone call or consulting the official documentation that came with the system should provide ample details of the feasibility of using a blanket. With a limited budget in mind, we found that the M-D Building Products 4663 R-6.7 Water Heater Insulation Blanket offered the best use of your money. The 4663 is a matted fiberglass blanket with a white vinyl top layer built to work on all types of water heaters including electric and gas models. It is ideally suited to 60 gallon tanks and offers an R-value of R6.7. This represents a decent amount of insulation that is perfect for tanks that leak a moderate amount of heat. The blanket ships with clear instructions and all the tape you need for the installation. The weight of the roll is 8.8 ounces so you won’t struggle to lift it up to a second floor tank or to a garage. Dimensions are 48 inches circumference and 75 inches top to bottom, thickness is about two inches. We recommend measuring your tank before purchase to ensure it fits. You may need to buy two rolls if you have an oversized 60 gallon tank. Lower capacity tanks should be fine with one roll. In terms of downsides we found that the fiberglass is somewhat messy when the blanket is first unpacked so keep this in mind. In addition, the tape isn’t of the best quality and you may want to buy dedicated heat resistant tape that does the job better. All in all, the price is the best aspect of the 4663. That isn’t to say the blanket is bad, simply that you do indeed get what you pay for. Nevertheless, it contains heat reasonably well and should provide a decent amount of saving on your energy bill. You can quickly recoup its purchase cost. Another contender in the budget category is the Frost King SP57/11C Water Heater Blanket. Made of fiberglass with a vinyl outer layer, the blanket works well on any kind of water heater tank that fit fairly standard manufacturing dimensions. The blanket is designed to fit tanks up to 60 gallons and its Resistance value is 10, which means a high heat trapping quality that would work best with older tanks and systems installed in colder rooms, like an outhouse. Foil tape is included with the blanket, though we found it to be somewhat lacking in terms of quantity and adhesiveness. As with the 4663, we recommend buying a separate roll yourself. The blanket is three inches thick and measures 48 inches by 75 inches. The instructions are relatively good and provide step-by-step stages. The fiberglass sheds quite significantly so wear protective gear when installing and you may find that some of the uniformity of the thickness has shifted during transit. As above, make sure it fits your tank before purchase by measuring up and don’t hesitate to overlap two rolls if need be. More insulation is better than having a vertical portion uncovered. Heat will simply escape from that exposed point. It weighs a reasonable 5.45 pounds and is no trouble to carry, even when test wrapping a tank. To finish, not a bad product for the price though it does lack in some areas. The price is proportional to the quality; it definitely isn’t the best blanket available on the market, but we didn’t expect it to be at such a low price. Water heater systems that date back less than a decade have much better insulation as a standard feature. With this in mind, it is unnecessary to cloak one in a blanket with a high R-value because the extra heat resistance is simply futile and serves no purpose. During our research we found that the Frost King Water Heater Blanket was the most suited to new heater systems. Put together with an inner layer made of matted fiberglass covered with double-sided foil, this blanket happily covers most 60 gallon tanks, particularly newer models regardless of energy source. It has a R-3.5 rating. The low R-value is perfect to compliment a new water heater with an inbuilt insulation layer with a value of R-24. The blanket adds that extra bit of protection to maximize the tanks efficiency. The R-value means it only has a thickness of one inch, but don’t let this fool you as it performs its function well. It measures 48 inches circumference and 75 height, and weights a very light 2.8 pounds. Instructions are precise and well thought out for easy installation. The tape is somewhat lacking and we recommend getting a heavy-duty alternative to ensure the blanket doesn’t unexpectedly peel off a couple of weeks after it’s fitted. As with most blankets, it requires a trim during installation. Overall, the SP57 saved a reasonable amount on energy bills in relation to the already efficient design of modern heaters. For the price, it is definitely worth the money in our book. 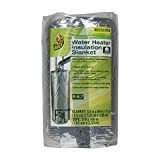 The best step up water heater blanket is the SmartJacket Water Heater Blanket Insulation System. We liked it because it offers a more comprehensive product than cheaper counterparts. Unlike other models, it’s crafted with aluminum foil and not fiberglass so you have a non-toxic and non carcinogenic material that doesn’t shed or create a mess during installation. Cleaning foil is also a lot easier than vinyl. The blanket is designed to wrap around any tank up to 60 gallons, including electric and gas systems. The R-Value is a respectable 7.1, which equates to significant savings in the order of approximately 9%. The cost is, therefore, easily paid back within a few months. The SmartJacket’s unique selling point is a design that creates a small gap between the tank and the blanket to add an extra barrier to trap in any dissipating heat. In addition, it ships with an extra sheet of insulation that works as a top lid on your boiler to insulate even more. We found the installation easy, the two feet of foil tape work well. Measurements come in at 24 inches width and 84 inches length. The only real issue is that the instructions are rather simple, though they do flag up the risks of installing the blanket incorrectly to a sufficient degree. We feel more information about the need to cut out space for crucial parts in the top lid were somewhat lacking. Our final impression was nevertheless very positive and the SmartJacket is a recommended purchase from us if you have a little more money to spend on a blanket. The SmartJacket is also available in a larger size that fits boilers up to 80 gallons. The price isn’t much different and it has all the same features as the smaller model, except with an R-Value of 6.9 to compensate for the larger size. When working with equipment powered by an open flame, safety is always a prime consideration. As our safety conscious pick, we chose the Duck Brand 280464 Water Heater Insulation Blanket. Contrary to most models, the Duck Brand blanket is made with recycled cotton with a foil wrapped outer layer. Not only is cotton easier to manipulate, it doesn’t irritate the skin or shed and in this case is class A rated flame retardant adding an extra layer of safety. Cotton also has great insulating properties meaning the R-value rates at a 6.7. The blanket fits tanks up to 60 gallons and should fit most standard design heaters without any issues. Dimensions are 1.8 inches thickness, 48 inches width and 75 inches length wise. We found that it wrapped comfortably around tanks and the tape provided was strong and durable. Installation instructions were sufficiently concise and user-friendly. Customer reviews are systematically good proving the overall quality of the blanket. We found that it performed best on older boilers in conjunction with wrapped pipes for maximum efficiency. The added fire safety material also scored highly for us. All in all, a reliable and cost-effective blanket that should pay for itself rather quickly. 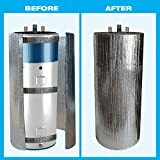 For medium sized water heaters with a tank around 50 gallons, we recommend purchasing the Reflecto-Foil Water Heater Jacket. Designed for tanks up to 60 gallons, we felt it was at its best on a slightly smaller capacity tank. The material used is a layer of polyethylene bubble compacted between patented Reflecto-Foil, which is a foil wrapping purposely crafted to limit heat dissipation. It is rated Class A for flame resistance and is non-toxic, has no carcinogenic airborne elements and has no mess fibers that cause issues during setup. The R-value is a respectable six, but what makes the Reflecto-Foil work is its ability to reflect any heat that escapes back into the tank, then on to the water inside. It, therefore, provides insulation as well as a heat reflecting barrier. The manufacturer claims that it halts up to 97% of heat loss. Measurements are 73 inches height, a circumference of 75 inches and a thickness of one inch. It even includes foil spacers that fit on the tank before the blanket is applied to ensure reflection performs at its best. The kit also includes relatively adhesive tape fit enough for the job and clear instructions. The Reflecto-Foil is very light as well to make installation even easier. The blanket itself is delivered in two separate pieces, one for the top half of the tank and the other for the bottom half. Upon installing the blanket, we had quite a few odd pieces left that fit perfectly on adjacent piping, saving us the cost of additional pipe insulation. The energy efficiency of this model easily matched those of fiberglass and cotton alternatives. We estimate the cost is recuperated within a few months. The Reflecto-Foil is hands down the best blanket for 50 gallon tanks and reviews point to this fact unanimously. For those of you with larger tanks, we felt that the ESP Low-E Water Heater Jacket offered the best option on the market. This USA made blanket is a non fiberglass build consisting of aluminum-treated polyethylene bubbles sandwiched between double-sided reflective foil. This makes setup a lot easier, and the materials are non-toxic and non-irritating as well as being fire retardant Class A rated. They are also rot and mildew resistant, and are immune to moisture. The insulation cuts easily and we were able to carve out holes for controls and the thermostat without too much trouble at all. The Low-E is ideal for 80 gallon tanks and below. The R-Value is a low five. However, consider this coupled with the reflective capacity of the blanket and the radiant heat loss is minimized significantly. The manufacturer estimates saving of up to 20% on energy bills, which is a more than respectable number. Measurements are about one inch thickness, six feet circumference and nine feet length. From our experience with the Low-E, we found these dimensions to be perfectly adequate for a large 80 gallon tank with even some material to spare for other projects. Installation is clean and looks sharp, making your boiler look like something out of a sci-fi movie. Instructions are clear, yet succinct. The kit ships with the blanket, self adhering foam spacers and scrim foil seam tape. Our final verdict on the Low-E is a quality product at an affordable price that has more than enough material to wrap even the biggest domestic tanks. In terms of fiberglass alternatives, we gravitated towards the Nasa Tech Heavy Duty Reflective Foam Core Non Fiberglass 80 Gallon Water Heater Tank Insulation Wrap, which is designed for larger tanks as well. The non fiberglass inner layer is made of high quality polyethylene bubble, then sealed by two layers of aluminum foil. The materials are hypoallergenic and non toxic, as well as being fire safe with a classification A rating for added peace of mind. The R-value is five though the blanket also uses reflection technology to redirect heat back to the tank when it attempts to radiate outwards. You can expect significant savings depending on usage and energy prices. The blanket is six feet width and eight feet in length, with a thickness of about one inch. There is ample material to cover tanks up to 80 gallons with some trim to spare. The material cuts well making installation rather straightforward. The provided setup guide is useful as well. The non fiberglass materials are the main benefit of this model, though it is very efficient as well. When we installed it, we found that water held heat for up to twice as long as before. The larger tank compatibility rounds the package off perfectly. The blanket ships with foam spacers and foil tape with enough length to wrap the entire heater and then some. The blanket with the highest R-Value that passed our qualitative measures test is the Frost King SP60 Water Heater Insulation Blanket. It employs fiberglass as its main insulating material, then is covered in vinyl on both sides. It fits most tanks as well as fuel types, including oil and gas. The blanket is large enough to comfortably cover water heaters with a capacity of up to 60 gallons. The SP60 weighs a respectable 5.7 pounds. A low weight given the density of the insulation and one that won’t hinder setup. The R-Value is a very high ten. This is among the highest ratings among the products in our guide. You can expect real savings and unmatched energy efficiency. Dimensions are three inches of thickness, 50 inches tall and 90 inches long. As with all the fiberglass models above, setup can be messy so take the necessary precautions to minimize the spread of debris and protect yourself from airborne fibers before beginning. Maintaining air quality is of utmost importance. The instructions are well documented and written. The SP60 comes with the required tape, which we found reasonably suited, though we did use some extra to securely pin down the blanket on a larger tank. Overall, the high insulation rating is what stands out when considering the SP60. The fiberglass is a negative, though we felt it didn’t detract too much from the quality of the blanket.